The journey to finding my creative passion has been long and rewarding. My sister and I grew up with the freedom to make things and get our hands, experimenting with all sorts of artistic mediums. 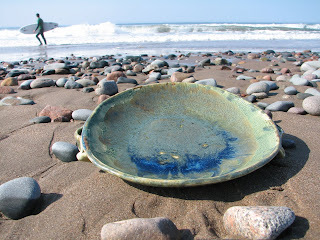 A few years back I took a pottery course with a local ceramic artist, Carol Smeraldo. She was wonderful, introducing us to different projects including hand scultping with clay. I made this platter in one of her classes. I fell in love with pottery. Shortly after I took the class I met a kind and generous local artist, Gloria Dunbar. She welcomed me into her studio with open arms and allowed me to use her wheel and kiln. I made a few pieces that I'm really happy with and gave most away for Christmas gifts. I haven't played with clay in years, but will someday return to this graceful craft. I love the fluidity and vibrance of watercolours. 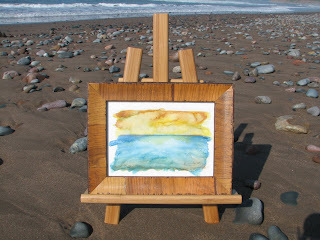 Here is a little seascape I painted last year just for fun. I'd like to experiment a bit more with this medium. But at the moment I'm having way too much fun with the buttery texture of oil paints! Hey Daina(mother of 2 mutts ;-) ) Yes I do remember you, the beach was swathed in fog that morning...such a great feeling. On the way back from the other end the sky cleared..quite lovely...I'll be following you and your family...cheers! I took a pottery class about 6 years ago and I LOVED it too! I made so much pottery but just for one year because I moved away after that an the pottery guild is way more expensive in my new city. I also gave most of my creations away as Christmas gifts, it was so fun.